When you think about all the great burgers in NYC, a few names will always come up. And in my opinion, you have to differentiate between gourmet and fast food burgers. I absolutely love the burgers at Shake Shack and Minetta Tavern, but you simply can’t compare the two in the same category. Now I have read about the fabled off-menu burger at Gramercy Tavern before, but never got the chance to try since it’s only offered during lunch (and possibly dinner if they don’t run out, but that doesn’t happen very often). Recently, another foodie friend ordered one and told me I had to try it. You know, purely for the sake of trying every available burger out there and then making informed decisions, definitely not because I wanted to…nod nod. The atmosphere at Gramercy Tavern is great. Whether you dine in the tavern or the dining room, you will have an excellent experience with service to match. However, since the burger is only offered in the tavern, I walked in and made a beeline directly to the bar. I briefly glanced at the menu, but I knew what I was ordering when I woke up that morning. When the burger was placed in front of me, it was pure art; an arrangement of beautiful colors and shapes just calling out to me. Pure mouthwatering art. The burger patty had the perfect outer crust that was topped with melted oozing cheese and set in between a buttered and toasted wheat bun. A leaf of bibb lettuce, raw and caramelized onions, pickled watermelon rind, and blue potato chips finished out the picturesque plate. First, I put my burger together without any of the additional condiments and dove in for a few initial bites. The meat was juicy and well seasoned, but came out more medium than medium rare. Also, it wasn’t the juiciest patty I’ve had, but you can’t really complain when a small pool of meat juices starts forming under your burger. The cheese was full of flavor and just sharp enough to counter the meat. Next, I added caramelized onions to my burger that smoothed out the taste. And finally, I added the pickled watermelon rind. This was my favorite ingredient on the plate by far. 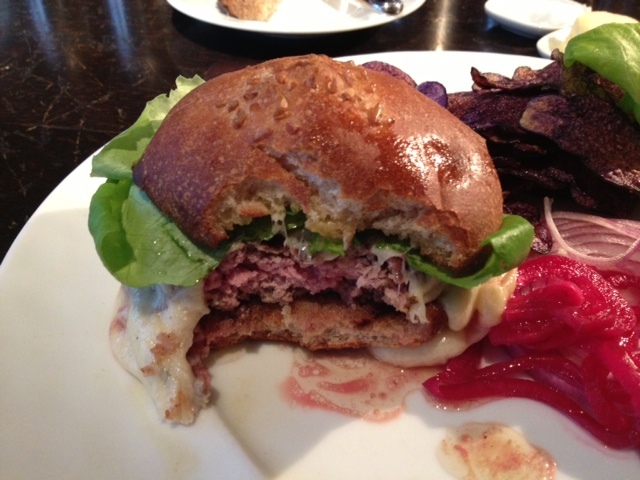 The rind added a great crunch to the texture of the burger. It was sweet and sour and balanced perfectly with all the other components of the burger. One small gripe I had was that the cheese hardened up pretty quickly, giving the burger a somewhat unattractive quality. Maybe I didn’t finish my burger quickly enough, but I doubt that. 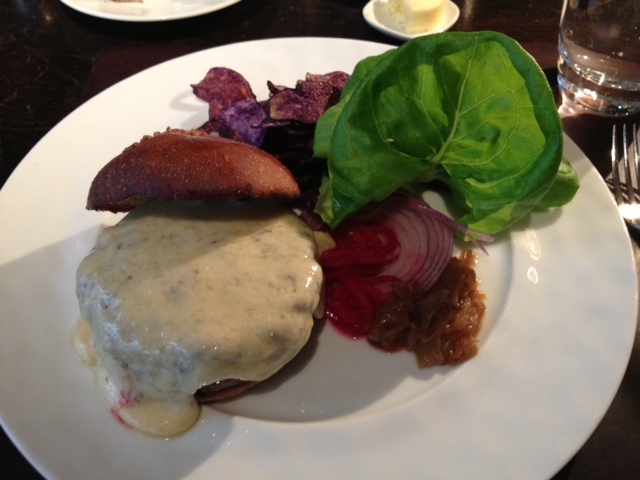 So if you’re in the vicinity of Gramercy Tavern during lunch time, I definitely recommend trying their burger. Don’t be alarmed if you don’t find it on the menu, because it won’t be there. Order it anyways. And be sure to try all the condiments on the burger for an overall delicious experience.